Home Celebrity Denim Cindy Crawford Goes Wild in Distressed Jeans! Cindy Crawford Goes Wild in Distressed Jeans! Cindy does look wild here!! Cindy Crawford is showing her wild side, pairing her animal print shirt with a pair of cropped distressed jeans with a cut-off and unfinished hem. Her jeans are in a medium blue vintage wash featuring a high rise. Cindy finished off her ensemble with a black Gucci belt and olive colored flats. Animal prints are huge this season and they are perfect to wear with any kind of denim. We specially love the lighter wash of Cindy’s jeans here – makes for a great contrast. 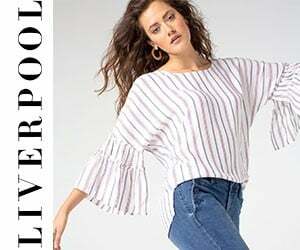 You can shop for lighter wash cropped jeans here, and we also found some great animal print tops from Alice + Olivia and from FOXCROFT.